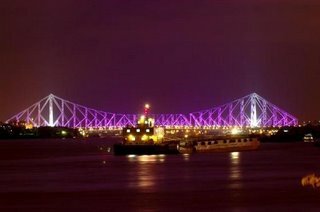 Kolkata is the city of joy, to make friends, taste roshogulla, leisure on the exotic ghats, travel in a tram, lost in the books and shop till you drop before Durga Puja .Me and my family plan to visit Kolkata from Delhi.We reach there in early morning, actually we went there for first time.We were so exicted.We search for hotel and get a very nice hotel.Once we got out into the city we found green coconut.Coconut water was very sweet.Then we proceed further for sightseening.Firstly,we went for boating, we hired one and went out to float on the river for an hour.The weather was so comfortable.After boating we went for having Bengali food and sweet curd which is very popular.Here are some of the list of places where we enjoy alot. Victoria Memorial : Built in 1901, Victoria Memorial is the memorial of Queen Victoria also called the Empress of India. It is now turned into the museum and is one of the famous tourists attraction in Kolkata. Princep Ghat : Princep Ghat is a popular Heritage Building in Kolkata, located near the Vidyasagar Setu and the falls between the Water Gate and the St George's Gate of Fort William next door. The ghat was constructed in the year 1843 named after James Princep, who was the secretary of 'The Asiatic Society' from 1832 -1838. Tourist can enjoy the exotic boat ride from Princep Ghat to Kashipore that allow you to see several other ghats on the way with the backdrop of old factories, bungalows and mansions along with the modern high tech buildings. Kolkata Sweets : People in Kolkata are fond of eating sweets. Roshogullas, sandesh and mishti doi are among the most famous delicacies of Kolkata. Kolkata Trams : If you are in Kolkata don't forget to take the pleasure of traveling in trams, as Kolkata is the only city in India to have a tram network. Mother Teresa Sarani : Park street also known as Mother Teresa Sarani is the most reputed corner of the city of Kolkata. It is flooded with some of the poshest bars, restaurants, discos and book stores.Here You could get Saurav' Ganguly - Food Pavilion. Dalhousie Square : Located just south of Howrah Bridge, the Dalhousie Square is the most popular tourists attraction in Kolkata. The area consists of many historical buildings, offices, business centers and banks which surround the square. Birla Planetarium: It is of the largest Planetarium in Asia, it gives a ringside view of the astral play of celestial bodies.You can Choose from Hindi, English and Bengali shows. Eden Garden : Famous Cricket stadium.